Eyes can be drawn to colour almost immediately. You may even find that colour has the ability to dictate how we feel. Colours are universal, symbolic and powerful. They are seen by some and felt by others. How beautiful would it be to capture this atmosphere in your own home? When styling a table, you can distinguish colour through almost anything and even though viewing colour is an extremely subjective process, they can work in every aspect of your styling decisions. Take a look at these images for example. 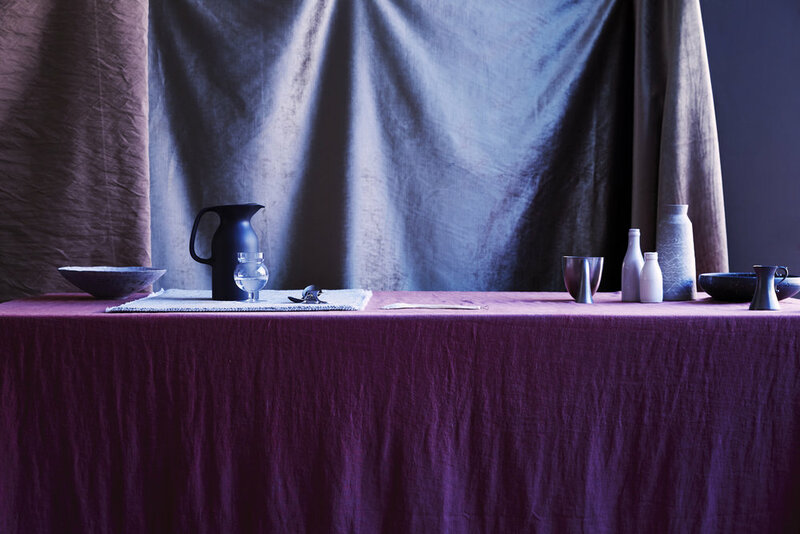 There are different shades of colour in the background, table cloth, the objects on the table and they mould together effortlessly. What I hope this portrays is an intricate simplicity. Two overall colours, one warm and one cool, that blend and intertwine. The lightness of the blue shades and the depth of the shades of red create a harmony that can be present in any home. The pieces on the table collaborate in their space, forming many enjoyable focal points for the eye. They are organised in a creative structure that emphasises their individuality, whilst demonstrating their collaboration. Look for objects that may seem unusual, that have a touch of quirkiness about them. Placing them in the same space can create a unique atmosphere, that can make your table ever so inviting. Studio Delmar styled the featured holiday house located on Sydney’s Palm Beach mixing European heritage with casual beachside living. Furniture, art and décor was layered throughout to suit the subdued interior palette. Modern sculptural forms, ceramics and glassware, in a selected medley of black and white, express the client’s youthfulness amongst the detailed interiors, whilst muted, soft tones are brought into the spaces with decorative cushions and linen. Architecture and interiors by Alexander &CO., Photography by Felix Forest, styling by Studio Delmar and words by Anna McCooe. Art and décor - Olsen Gallery, Julian Meager, Noah Taylor, Planet Furniture, Hub Furniture, Becker Minty, Kerrie Brown, Graphis Art + Framing, Ondene, Living Edge, Janus Et Cie.